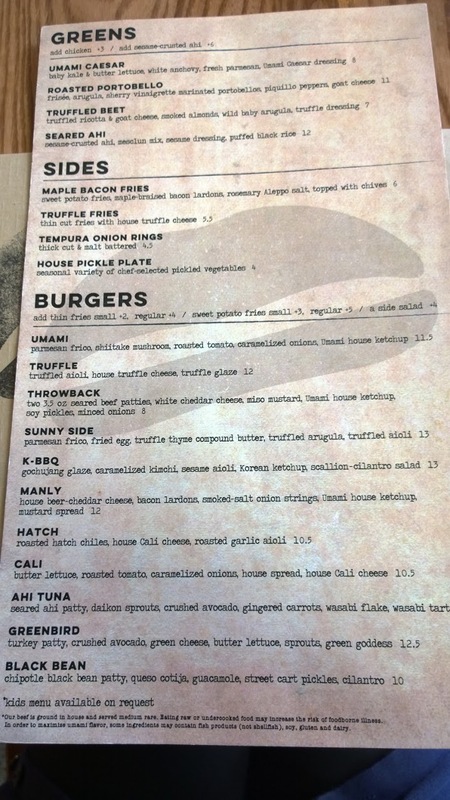 During my trip to San Fran, Rae and I stopped by Umami Burger because it was close to our apartment. 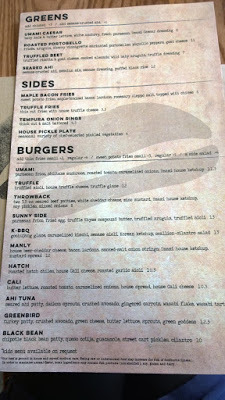 I always just knew of this restaurant as an LA hipster burger joint with a cool “U” stamp on their burger buns. They seem to be quite popular with line ups spewing onto the streets on a random weekday afternoon. It’s quite casual inside with lots of booths and tables. 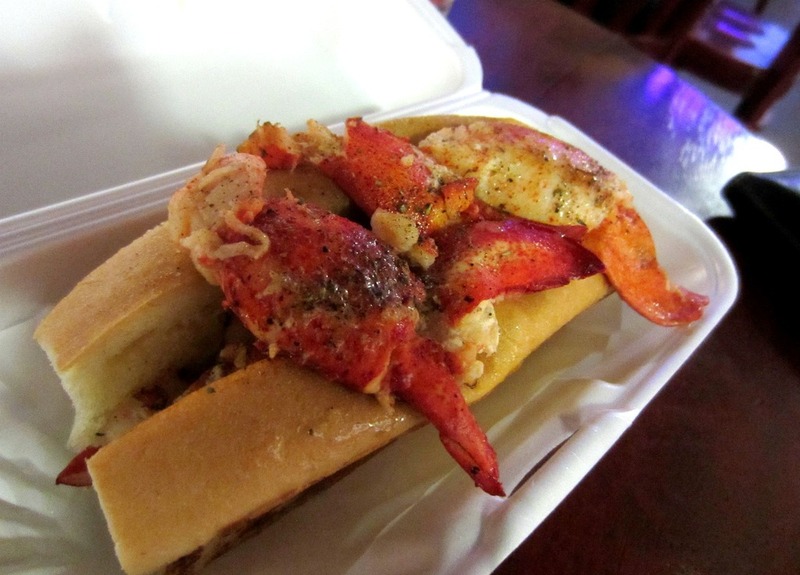 It kind of reminds me of Romers Burger Bar from Vancouver. 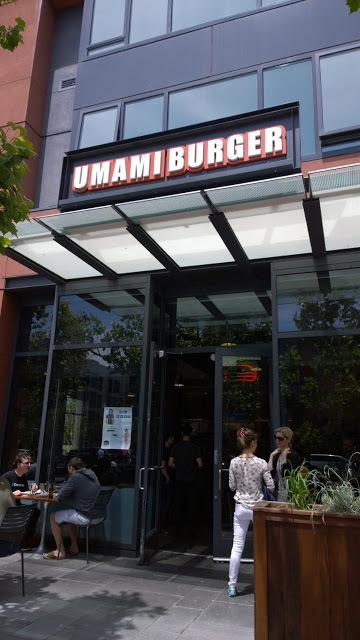 Obviously, their most famous burger is called the Umami Burger but they surprisingly have quite a few options for those that don’t feel like eating beef. 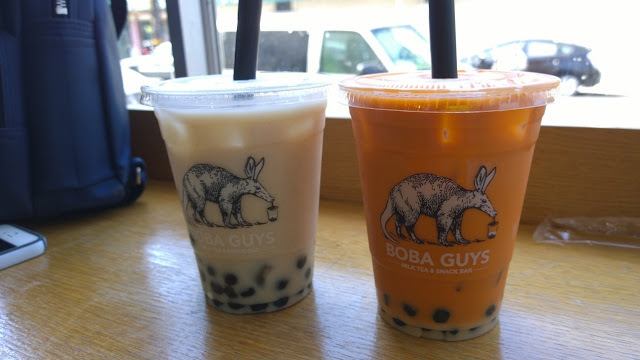 They’ve covered all their bases with black bean patties, ahi tuna for fish lovers, and even some ‘manlier’ patties like the Manly Burger. Rae and I both got some beer to wash down our burger with. 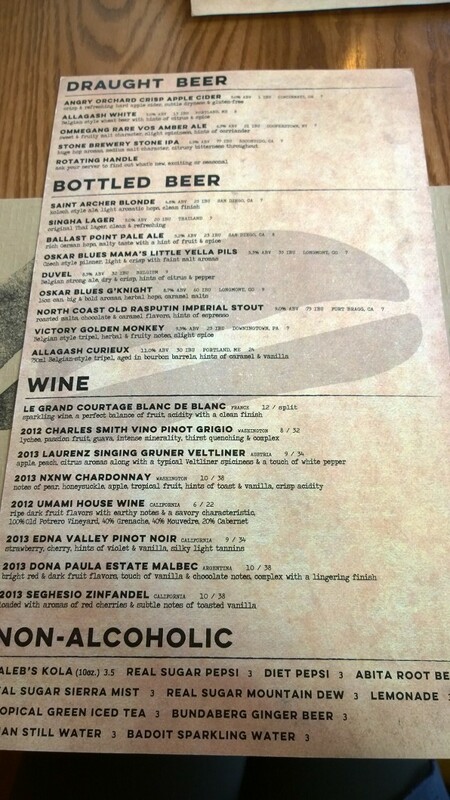 I opted for the highly alcoholic Golden Monkey (9% alc.) and she got a brown pale ale of some kind that she really liked. 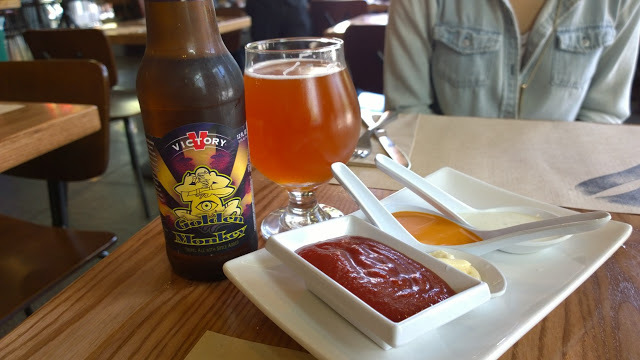 They also gave us a plate with four different types of aiolis, sauces, and homemade ketchup. We didn’t know what they were for, so we kind of just dipped our fries in it. 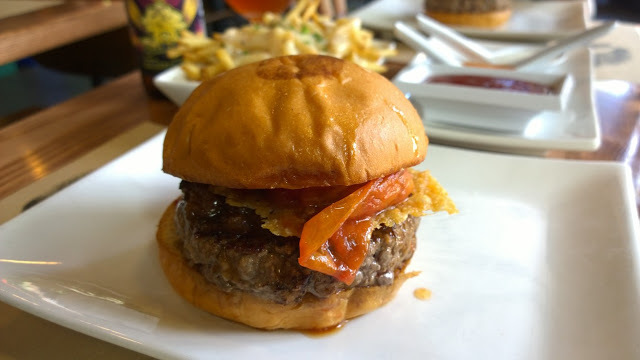 We both wanted to try the original so we got the classic Umami Burger ($11.50) which has parmesan frico, shiitake mushrooms, roasted tomato, caramelized onions, and Umami house ketchup. 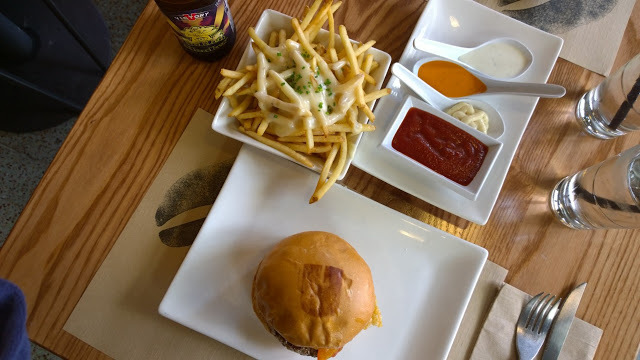 Our server praised their chain for using only the most local, organic, and fresh ingredients which include the ground beef they use to make the patty with. That’s why all patties are served medium rare unless specified. I got the burger as is so as you can see, it was quite rare. 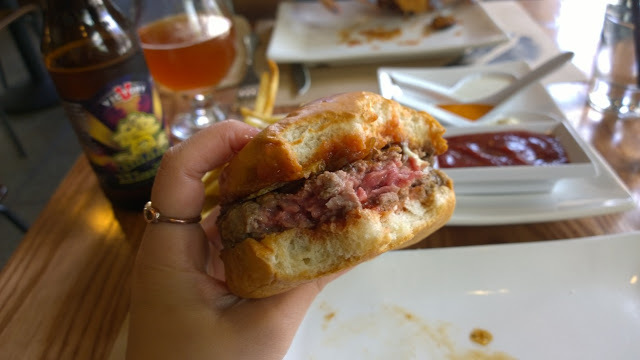 It’s a little freaky to see your burger patty so pink because it looks you’ll get salmonella. LOL. 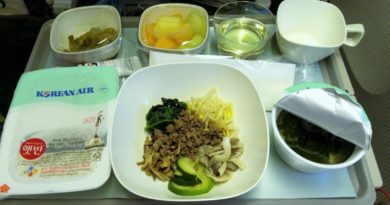 It was delicious though and the ‘fresh’ ingredients really did shine through. One thing Rae and I both noticed though, were the lack of toppings. We literally got two slivers of mushrooms on each burger and that’s it. Last but not least, I ordered a side of Truffle Fries ($5.50) to add some carbs to my diet. 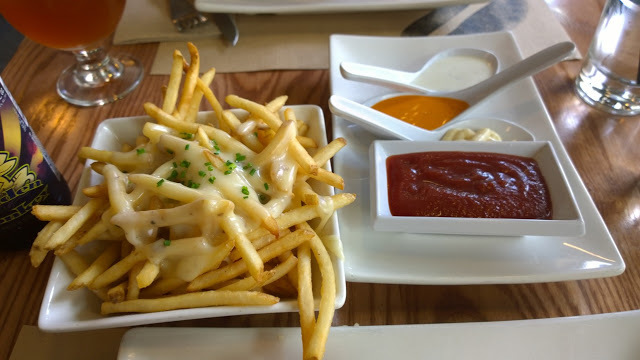 Also, if truffle fries are on the menu, I have to try it at least once. These ones were disappointing though. The truffle was only infused in the cheese and the cheese solidified quite quickly after it was brought out so the whole thing was one clumpy mess. Not recommended. 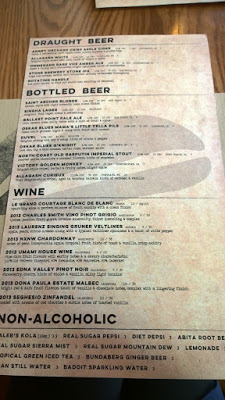 All in all, Umami Burger is solid if you want to just try their burgers and beers. Their burgers are unlike any burger I’ve tried before and is way beyond the quality of the ones at A&W or Earls. Skip the truffle fries though, they’re just not worth it. 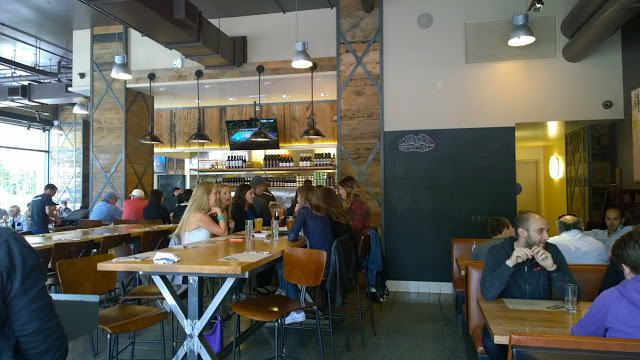 ← Sushirrito (San Francisco) – Please Bring This to Vancouver!! !